My story start with an usual night with my girlfriend. We were having a wonderful time when she complained that she was not feeling well, so I insisted she go home. I decided to take a shortcut on an older highway in order to get her home quicker. When we reached her place, I made sure she was comfortable and then left for home. Since I was tired and hungry, I decided to take the old highway. It is also nearer to an all-night eatery where I could get coffee and a bite to eat. Nothing happened on the road though I must admit that I was feeling odd. Half-way through, I was beginning to feel like something is sitting behind me. My motorbike was feeling heavier and heavier and no matter how hard I turned the throttle, the bike could not go faster. I was running on a full tank of fuel. I was beginning to feel a little spooked. I sensed something is behind me and I felt something brushing on my neck. Come to think of it, it actually felt like hair! Well, I couldn’t stand it and my curiosity took over. I quickly turned my head to see what was bothering me. I had the shock of life. It was a lady, in white, with long hair. Her face was turned away. My God...it has to be a pontianak! What was I going to do? She was sitting on my bike, the kampong fashion. Her legs were not across the seat but instead sitting on the side, her legs together and facing my right direction. Thank God I didn’t get to see her face! In a matter of 2 seconds, I looked back in front and focused on the road. I prayed to myself...please GOD help me! Soon I reached the main road and the weight lifted off the bike. I sped all the way home. The old highway is off limits from now on! Ahmad H.
According to my grandmother, the old people in the Kampung days, believed that pregnant women, especially those pregnant with their first child, give out a scent that will attract the evil spirits, namely pontianak and penanggal. These women are not allowed to leave their homes after dusk, but if they have to, they would have to bring with them a small pouch containing several sharp and metal objects and some herbs that will ward off these evil spirits. Well, two years ago, when I was pregnant with my first child, my grandmother made the small pouch for me to carry around. I didn't want to offend her, as I do not believe in all these tales, took it from her but later stashed it away in my cupboard. An act which I later regretted. On that fateful day, I had to stay late at work. My husband fetched me at about eight o’clock. I was already in the seventh month of my pregnancy, so I felt very tired. After he parked the car, we started our way to our apartment. That’s when I smelled a very strong fragrant odor. There was no one else there except the two of us. I asked my husband if he smelled the perfume but he asked me to stay quiet and quicken our pace. The smell got stronger and stronger until I felt as though I could not breathe. I was suddenly gasping for breath and my husband realizing my condition, stopped in his tracks and muttered some Quranic verses under his breath and I immediately felt better. Upon reaching home, I rested for a while and later bathed and perform my prayer. I was still a bit weak after that incident so I immediately went to bed. At 2 am, my husband and I were awaken by a scratching sound on our windows. Then the sound of stones or something like that being hurled at my window - on the 20th floor! I was trembling with fear and I suddenly felt a sharp pain in my tummy. My husband remained calm and asked me to rest on the bed, perform ablution and sat next to me reading the Quran aloud. Then there was a loud and shrieking laughter outside our window! The scratching was heard again. This time more ferocious. My husband read even louder and he start reciting some verses that are for warding these evil spirits. The pain in my tummy got worse. The shrieking grew louder but my husband kept repeating the verses over and over again until the shrieking was gone. The pain in my tummy soon vanished. The horrific incident left me trembling and I was ill for the next few days. That was an experience I will never forget. I told my grandmother about it and she was angry because I did not heed her advise. She said the thing outside my window was the pontianak either trying to lure me out or trying to get in herself. I was so relieved that my baby is alright and I have learned my lesson the hard way! Citra V.
This guy named Ismail was returning home from his cousin's house as it was during the Hari Raya. His cousin's house was in Yishun and he was heading to Pasir Ris that where he lived. While riding along Punggol, he was feeling strange all of a sudden. He continued to ride until there was a Malaysian plated motorcycle. When they were side by side, this old Malaysian guy turned to him and then speed faster. Ismail didn't care and just kept on riding until he was again riding side by side with a old man. He was riding a Vespa motorcyle. The old man turn to look at Ismail and again the old man speed faster. Ismail thought that he wanted to race. After a few minutes, he looked at his side mirror as he felt as if there was someone riding behind him. He look at the mirror and saw a white dress. He again looked at the mirror and saw a woman with long black hair and then it strikes him that there was evil riding behind him. Ismail says “I did not disturb you and you please...do not disturb me”. He was in total fear! When he reach a junction at Pasir Ris, he was getting ready to stop at a red light. This 'thing' pulled near and began to laughed. Ismail didn't care weather it was a red or green light, he just sped off until he reached home. Without even taking the key and parking at the correct spot, he rushed to his house. Reaching his house, he tells his elder brother what happened. His brother said he was lying. They both get on their motorcycles together...Ismail rode behind his elder brother. When they see the motorcycle, the Pontianak was sitting and smiling at them. Ismail scolded his elder brother for not believing him. His brother quickly shouted prayers and the 'thing' was gone. Ismail rushed back home leaving his brother alone. In this story, Ahmad, a man in his mid-twenties, claims to have encountered these strange entities while driving home from Tutong Town. This unfortunate incident triggered months of restlessness and paranoia but yet here, he recalls the sequence of events leading up to that fateful night as he faced his worst nightmare. Driving down the highway, Ahmad tried to adjust his focus and eyes on the road as fatigue and lethargy took control of his body. The long working hours at his new job had taken its toll and left him practically exhausted. After several failed attempts to keep himself awake, Ahmad finally gave in and decided to stop at the side of the road to get some shuteye before continuing his journey. As he turned to make a stop, his eyes caught sight of a strange looking ‘object’ in the middle of the road that seemed to resemble a log but simply shrugged it off as nothing out of the ordinary. However, as Ahmad peered closer at the weird object, he could make up some facial features but it was too dark to tell whether his imagination was beginning to run wild. Despite the warning which echoed in his mind to ‘run away’, he simply refused to steer clear of whatever was on that road. Curiosity got the better of him and he took a torch light out of the glove compartment to investigate what it really was. As Ahmad approached the ‘object’, it laid so disturbingly still as if waiting to strike. He suddenly stood frozen in his tracks as the ‘mysterious object’ lifted its head slowly in his direction and let out an ear-piercing cry. Fear overtook the very core of Ahmad’s mind and he knew instantly what the ’strange’ object was. He struggled to summon his inner strength to face the terror staring him right in the eye. “This was something that you could only see in horror films,” Ahmad said. He watched the terror unfold as the paranormal entity, commonly known as ‘pontianak’ to the locals, crawled to the side of the road and began creeping towards a lamp post. Within split seconds, it swiftly moved towards him and all he could do was recite prayers to ward off the spirit. The ‘pontianak’ stared at him intently before disappearing into thin air. The memory of such a disturbing image, till this day, seems difficult to erase and has changed his philosophy on the existence of paranormal entities. “I think it’s a good idea to share my experience with fellow readers on this issue. Whether they choose to believe it or not, is of course up to them. However, this is not something you simply make up. It took me quite a while to try and forget this horrifying incident but I decided to instead use it as a lesson in life,” he said before concluding his story. 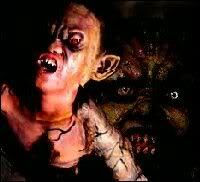 Tiyanak (Demon Child) or impakto are creatures which, in Philippine mythology, imitate the form of a child. It usually takes the form of a newborn baby and cries like one in the jungle to attract unwary travelers. Once it is picked up by the victim, it reverts to its true form and attacks the victim. Aside from slashing victims, the tiyanak also delights in leading travelers astray or in kidnapping children. Some say the tiyanak are babies who died before receiving baptism rites. After death, they go to a place known as Limbo, a chamber of Hell where unbaptized dead people fall into and transform into evil spirits. These phantoms return into the mortal realm in the form of goblins to eat living victims. The tiyanak can also be the offspring between a demon and a human or an aborted fetus, which comes to life to take revenge on its mother. There are several versions of Tiyanak physical descriptions and activity. This mythical creature are also sometimes related to a Malaysian folkloric creature called Pontianak which is, according to Malay folklore, a woman who died during delivery or childbirth. The Pontianak - in Malay folklore, it usually announces its presence through baby cries or assumes the form of a beautiful lady and frightens or kills those unlucky enough to come too close. It disguises itself as a beautiful young woman mainly to attract its victim (usually male). Its presence can sometimes be detected by a nice floral fragrance, followed by an awful stench afterward. According to folklore, one can bewilder the creature and break loose from the enchantment of its cries by turning his clothes inside out. The legend has it that Tiyanaks find this method laughable and would just leave the victim alone. Some say that repellents like garlic and the rosary can also drive the tiyanak away. 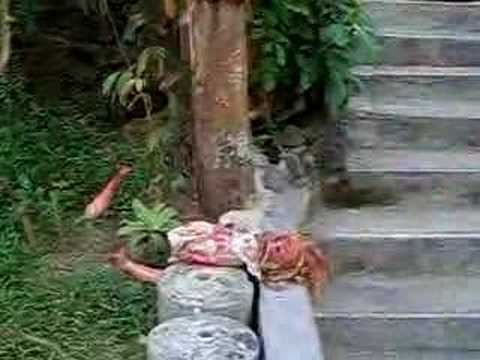 A screencap from a Filipino police video that supposedly depicts a young girl who was butchered by family members that suspected she was a tiyanak. It is alleged that the girl lured an older boy into the jungle and murdered him. I don't know the validity of the video but I decided to post it anyway.